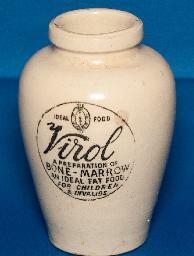 Description: Elegant stonewear jar bearing the stamp: 'IDEAL FOOD, Virol, A PREPARATION OF BONE-MARROW,AN IDEAL FAT FOOD FOR CHILDREN AND INVALIDS'. The jar appears to date from the 1900s. There is no mention of vitamins, suggesting this date is reasonable. The poster image has a slightly different legend: "AN IDEAL FORM OF FAT FOOD FOR CHILDREN AND INVALIDS" LANCET'.